Here is the list of the hotels near Limeyrat. Book your hotel near Limeyrat today, Thursday 09 May for the best price, reservation and cancellation free of charge thanks to our partner Booking.com, leader in on-line hotels reservation. Below here is the list the 50 closest hotels of Limeyrat, sortable according your criteria. You will find the position of these accommodations on the Limeyrat hotels map. Set in Limeyrat in the Aquitaine region, the villa has a terrace. This villa features a private pool and a garden. This villa comes with a kitchen, a seating area, and a TV. Limeyrat offers an outdoor pool. The property has a barbecue, along with a water sports facilities. Sarlat-la-Canéda is 48 km from the accommodation. The nearest airport is Brive Dordogne Valley Airport, 62 km from Limeyrat. Château de l'Etang is situated in Limeyrat. The property has garden views. The holiday home is equipped with 3 bedrooms, a TV and a fully equipped kitchen that provides guests with a dishwasher. The holiday home also includes a seating area and 1 bathroom. Sarlat-la-Canéda is 49 km from the holiday home, while Périgueux is 25 km from the property. The nearest airport is Brive Dordogne Valley Airport, 64 km from Château de l'Etang. Situated in Limeyrat, Maison De Vacances - Ajat provides accommodation with a terrace and free WiFi. Guests staying at this holiday home have access to a fully equipped kitchen. The holiday home comes with a TV. The holiday home offers a barbecue. Guests can relax in the garden at the property. Sarlat-la-Canéda is 45 km from Maison De Vacances - Ajat, while Brive-la-Gaillarde is 49 km from the property. The nearest airport is Brive Dordogne Valley Airport, 60 km from the accommodation. Set in Ajat, 30 km from Périgueux, Domaine des Ormeaux boasts a hot tub and sauna. Brive-la-Gaillarde is 48 km away. Free WiFi is offered. All units feature a flat-screen TV and DVD player. Some units include a dining area and/or terrace. A microwave, a toaster and fridge are also provided, as well as a kettle. Some units also have a kitchen, fitted with a dishwasher and oven. Free private parking is also available at this holiday home. Towels are available. DOMAINE DES ORMEAUX also includes a seasonal outdoor pool. A selection of activities are offered in the area, such as cycling and hiking. Sarlat-la-Canéda is 45 km from Domaine des Ormeaux. The nearest airport is Périgueux-Bassillac Airport, 23 km from the property. Gîte Au Pays de Jacquou is located in Fossemagne and offers a seasonal outdoor swimming pool and a tennis court. This holiday home features barbecue facilities, a garden as well as free WiFi. The holiday home is fitted with a satellite flat-screen TV and 1 bedroom. The holiday home also offers 1 bathroom with a shower. Continental and buffet breakfast options are available every morning at the holiday home. Gîte Au Pays de Jacquou offers a terrace. Cycling and hiking can be enjoyed nearby, and a bicycle rental service is available. Sarlat-la-Canéda is 46 km from the accommodation, while Périgueux is 27 km away. The nearest airport is Brive Dordogne Valley Airport, 61 km from Gîte Au Pays de Jacquou. Bed and Breakfast Fossemagne Preferred hotel ! Offering a seasonal outdoor pool, barbecue and terrace, Au pays de Jacquou : Chambre d’hôtes, table d’hôtes et gîte is situated in Fossemagne, 32 km from Sarlat-la-Canéda. Free private parking is available on site. Some rooms include a seating area for your convenience. You will find a coffee machine in the room. The rooms have a private bathroom. Extras include free toiletries and a hairdryer. Au pays de Jacquou features free WiFi . A flat-screen TV is offered. Upon prior booking, you can enjoy local, homemade meals on site. You can engage in various activities, such as horse riding and cycling. The bed and breakfast also offers bike hire. Brive-la-Gaillarde is 43 km from Au pays de Jacquou : Chambre d’hôtes, table d’hôtes et gîte, while Périgueux is 23 km from the property. The nearest airport is Brive Dordogne Valley Airport, 37 km from the property. Situated in Ajat, Ferienhaus Thenon 101S provides accommodation with a private pool. This property offers access to free WiFi. The holiday home includes a kitchenette with a dishwasher and an oven, as well as a coffee machine. Sarlat-la-Canéda is 43 km from the holiday home, while Brive-la-Gaillarde is 47 km from the property. The nearest airport is Brive Dordogne Valley Airport, 57 km from the property. Domaine Le Manoir is set in Fossemagne and offers barbecue facilities. This holiday home offers free WiFi, a garden, as well as a terrace. The holiday home has a flat-screen TV. A dishwasher and an oven can be found in the kitchen. Sarlat-la-Canéda is 43 km from the holiday home, while Brive-la-Gaillarde is 47 km from the property. Brive Dordogne Valley Airport is 58 km away. Set in Blis-et-Born, Holiday home La Lucie features accommodation with a private pool. Guests staying at this holiday home have access to a fully equipped kitchen. The holiday home offers an outdoor pool. Périgueux is 24 km from Holiday home La Lucie. The nearest airport is Brive Dordogne Valley Airport, 69 km from the property. Located in Brouchaud, La Peyrade 2 offers water sports facilities, a garden and a barbecue. Guests are welcome to go for a swim in the private pool and enjoy the free WiFi. The holiday home includes 5 bedrooms and a kitchen with a dishwasher and a coffee machine. A TV is available. The holiday home offers an outdoor pool. A terrace is available on site and horse riding can be enjoyed within close proximity of the property. Périgueux is 30 km from La Peyrade 2. Brive Dordogne Valley Airport is 63 km away. La Peyrade 1 is situated in Brouchaud and offers water sports facilities and a tennis court. This property offers access to a terrace. The holiday home features 4 bedrooms and a fully fitted kitchen with a dishwasher. A TV is featured. The holiday home offers an outdoor pool. Guests at La Peyrade 1 can enjoy horse riding nearby, or make the most of the garden. Périgueux is 30 km from the accommodation. The nearest airport is Brive Dordogne Valley Airport, 63 km from La Peyrade 1. Holiday home Puybouchey is located in Brouchaud and offers barbecue facilities. This property offers access to free WiFi. The holiday home is equipped with 2 bedrooms, a TV with satellite channels and a fully equipped kitchen that provides guests with an oven, a microwave, and a washing machine. Périgueux is 26 km from the holiday home, while Brantôme is 40 km from the property. Brive Dordogne Valley Airport is 66 km away. Located in Gabillou, La Ferme Des Vergnes offers accommodation with a terrace, kitchen and free WiFi. A microwave, a toaster and fridge are also offered, as well as a coffee machine. Guests at the farm stay can enjoy a continental breakfast. Sarlat-la-Canéda is 48 km from La Ferme Des Vergnes, while Brive-la-Gaillarde is 50 km away. The nearest airport is Brive Dordogne Valley Airport, 60 km from the accommodation. Guest accommodation Blis-et-Born Preferred hotel ! Featuring a garden, Maison à la Campagne offers accommodation in Blis-et-Born with free WiFi and garden views. Guests have a private terrace. The holiday home is composed of 2 bedrooms, a living room with dining area, a fully equipped kitchen and 1 bathroom. A flat-screen TV with satellite channels is offered. If you would like to discover the area, fishing is possible in the surroundings. Périgueux is 22 km from the holiday home. The nearest airport is Bergerac-Roumanière Airport, 69 km from the property. With an outdoor swimming pool, La Closerie des Arts is a guest house located in Gabillou and offering bedrooms and self-catering cottages. Free WiFi access is available. Some accommodations have a TV, a terrace and a private bathroom with a shower. In the morning, a continental breakfast with homemade and local produce is available. Guests can enjoy personalized Pilates and dance courses such as Salsa, Rock'n Roll and Argentinian Tango. At La Closerie des Arts you will find a garden. Other facilities offered at the property include a children's playground and a boule's court. An array of activities can be enjoyed on site or in the surroundings, including cycling and hiking. Thenon Train Station is 9 km away and the property offers free parking. Featuring accommodation with a private pool, Holiday Home Gite 06 is located in Blis-et-Born. This holiday home offers accommodation with free WiFi. The holiday home has 4 bedrooms and a living room with a TV and DVD player. The kitchen features a microwave. Holiday Home Gite 06 offers an outdoor pool. Périgueux is 18 km from the accommodation, while Brantôme is 44 km away. The nearest airport is Bergerac-Roumanière Airport, 67 km from the property. Set in Gabillou, Holiday home Les Chambons K-588 features a private pool. Guests may enjoy free WiFi. The holiday home includes 1 bedroom and a living room with a TV. The holiday home offers an outdoor pool. Sarlat-la-Canéda is 49 km from Holiday home Les Chambons K-588, while Périgueux is 33 km away. Brive Dordogne Valley Airport is 61 km from the property. Situated in Cubjac, Le Nid des Oiseaux offers accommodation with a terrace, kitchen and free WiFi. All units come with an oven, microwave, a coffee machine, a toaster and kettle. A patio with garden views is offered in each unit. Guests at this property can enjoy cycling nearby, or make the most of the garden. Périgueux is 22 km from the bed and breakfast. Brive Dordogne Valley Airport is 70 km from the property. Located on the banks of the River Auvézère, this 18th-century château features a swimming pool in the park lined with fruit trees. A continental breakfast of home-made bread and jams is served daily. The individually decorated guest rooms offer a view of the valley and a private bathroom. Each room features parquet flooring and some rooms also have a balcony. A 3- or 4-course evening meal made with fresh produce is prepared by the host 6 times per week upon prior request. You can enjoy a drink in Château de Barge's orangerie, and a children’s menu is also available. Périgueux is located 22 km from this B&B and you can visit the picturesque town of Sarlat, 51 km away. Free private parking is possible on site. Located in Thenon, Holiday home Maison Neuve H-612 provides accommodation with a private pool. This holiday home offers an outdoor pool and complimentary WiFi. The holiday home has a TV and 3 bedrooms. Sarlat-la-Canéda is 39 km from the holiday home, while Brive-la-Gaillarde is 47 km from the property. Brive Dordogne Valley Airport is 57 km away. Situated in Thenon, Holiday home Maisonneuve provides accommodation with a private pool and free WiFi. The accommodation is 39 km from Sarlat-la-Canéda. The holiday home features 5 bedrooms, a TV and a fully equipped kitchen that provides guests with a dishwasher, a fridge, and a washing machine. The holiday home offers an outdoor pool. Brive-la-Gaillarde is 47 km from Holiday home Maisonneuve. Brive Dordogne Valley Airport is 57 km away. Guest accommodation Rouffignac Saint-Cernin Preferred hotel ! Set in Rouffignac Saint-Cernin, 42 km from Sarlat-la-Canéda, Les Cabanes de Rouffignac offers a seasonal outdoor swimming pool and free WiFi. All units are equipped with a toaster, fridge, a coffee machine, a stovetop and kettle. A terrace with garden views is offered in every unit. A continental breakfast is available every morning at the holiday home. A bicycle rental service is available at Les Cabanes de Rouffignac, while cycling can be enjoyed nearby. Périgueux is 35 km from the accommodation. Bergerac-Roumanière Airport is 61 km from the property. Featuring accommodation with a private pool, Holiday home Cubjac M-572 is located in Le Change. This holiday home offers a tennis court as well as free WiFi. The holiday home is equipped with a TV. The holiday home offers an outdoor pool. Périgueux is 18 km from Holiday home Cubjac M-572. The nearest airport is Bergerac-Roumanière Airport, 67 km from the property. Located in Bars, La Sautie features free bikes. Featuring a 24-hour front desk, this property also provides guests with an outdoor pool. All rooms come with a terrace with pool views and free WiFi. The rooms at the guest house are equipped with a seating area, a flat-screen TV with satellite channels, a kitchen, a dining area and a private bathroom with free toiletries, a bath and a hair dryer. All units will provide guests with a dishwasher. A continental breakfast is served each morning at the property. La Sautie offers a barbecue. The area is popular for cycling and hiking, and bike hire is available at the accommodation. Sarlat-la-Canéda is 42 km from La Sautie, while Périgueux is 37 km from the property. The nearest airport is Brive Dordogne Valley Airport, 62 km from the guest house. Holiday Home St Pantaly D'Ans Dordogne is situated in La Forge-dʼAns. Guests have access to free WiFi. This holiday home has 1 bedroom, a living room and a fully equipped kitchen with a dishwasher. A TV is available. Périgueux is 30 km from the holiday home. The nearest airport is Brive Dordogne Valley Airport, 68 km from the property. Located in Thenon in the Aquitaine region, La Borie has a terrace. The holiday home features garden views and is 37 km from Sarlat-la-Canéda. This holiday home has 1 bedroom, a living room and a fully equipped kitchen. A flat-screen TV with satellite channels is featured. Brive-la-Gaillarde is 47 km from the holiday home. The nearest airport is Brive Dordogne Valley Airport, 58 km from the property. Featuring accommodation with a private pool, Holiday Home Lautherie Haute is located in Le Change. Guests have access to free WiFi. The holiday home comes with 2 bedrooms and a living room with a TV and DVD player. Holiday Home Lautherie Haute offers an outdoor pool. Périgueux is 16 km from the accommodation. The nearest airport is Bergerac-Roumanière Airport, 66 km from the property. Boasting accommodation with a private pool, Maison De Vacances - Eyliac is located in Saint-Pierre-de-Chignac. Featuring free WiFi, the property also has barbecue facilities. The holiday home includes 5 bedrooms, a kitchen with a dishwasher and an oven, as well as a coffee machine. A TV is featured. The holiday home offers a terrace. Guests can relax in the garden at the property. Périgueux is 18 km from Maison De Vacances - Eyliac, while Brantôme is 44 km from the property. The nearest airport is Bergerac-Roumanière Airport, 65 km from the property. La Lisiere is located in Auriac-du-Périgord and offers barbecue facilities, a garden and a terrace. Guests may go for a swim in the private pool and enjoy the free WiFi. The holiday home has 4 bedrooms, a TV and a fully equipped kitchen that provides guests with a dishwasher. The holiday home offers an outdoor pool. Sarlat-la-Canéda is 36 km from La Lisiere, while Brive-la-Gaillarde is 47 km from the property. The nearest airport is Brive Dordogne Valley Airport, 59 km from the accommodation. HOTEL RESTAURANT LE SAINT PIERRE "Grand Périgueux"
Le Saint Pierre is set in Saint-Pierre-de-Chignac, just 15 km from the centre of Périgueux. It offers a covered swimming pool, a games room and an on-site restaurant serving traditional cuisine. The rooms at Saint Pierre are decorated in a simple style and include an LCD TV. Each one also features free Wi-Fi access and an en suite bathroom, which is complete with free toiletries. A continental breakfast is served every morning in the restaurant, in the comfort of guest rooms or on the terrace. You can also choose to play billiards while enjoying a drink in the bar. Free public parking, bicycle rental and a laundry service are additional facilities at Le Saint Pierre. The A89 motorway is a 10-minute drive from the property and parking for 6 motorbikes is free. Gite "Au bout du chemin "
Featuring a seasonal outdoor pool and garden, Gite "Au bout du chemin " is a detached holiday home set in Lieu-dit Les Rigoux in the Aquitaine Region. The unit is 50 km from Sarlat-la-Canéda. Free private parking is available on site. There is a dining area and a kitchen. A TV is available. Périgueux is 18 km from Gite "Au bout du chemin ", while Bergerac is 51 km from the property. Bergerac-Roumanière Airport is 54 km away. Holiday home D31 is set in Balou. Guests staying at this holiday home have access to a fully equipped kitchen. The holiday home features a satellite TV and 2 bedrooms. The holiday home offers a barbecue. Sarlat-la-Canéda is 40 km from Holiday home D31. The nearest airport is Brive Dordogne Valley Airport, 53 km from the property. Bed and Breakfast Eyliac Preferred hotel ! Featuring free WiFi, Le Clos Romantic & Spa is a B&B set on a 4-hectare park. On site, there is a heated outdoor pool, a 50m² wellbeing centre,with a spa and steam sauna, and guests can enjoy a drink at the bar. There is also free private parking and a 24-hour front desk. The property is set on a hill with 360 views of the countryside. Certain units feature a seating area for your convenience. For your comfort, you will find free toiletries and a hair dryer. The air-conditioned well being centre features a tea room, a hot tub, a private balneo room and a large shower. Beauty treatments can also be booked. One of the terraces has barbecue facilities and other activities include table tennis, volleyball, badminton, darts, and more. The area is popular for horse riding and hiking. The historic centre of Perigueux is less than 15 minutes’ drive away and Roumanière Airport is 43 km away. Guest accommodation Azerat Preferred hotel ! In the heart of the Black Périgord, Maison d'hôtes Béchanou offers a salt-water swimming pool, a garden, a terrace, and free Wi-Fi throughout. The rooms and suite at Maison d'hôtes Béchanou feature a view of the countryside, a wardrobe, a desk and individual heating. The private bathrooms include a bath tub or shower and toilet. The continental breakfast is served daily and includes homemade jams, bread, cakes and yogurts. You can also choose to share meals with other guests and sample regional cuisine made with organic produce. Maison d'hôtes Béchanou is 12 km from Lascaux II and free bicycles are available on site. Free private parking is also provided on site. Located in the heart of Périgord Noir, Camping Bleu Soleil is set on a hill and offers views of the surrounding countryside, as well as a garden with an outdoor swimming pool and a terrace. At Camping Bleu Soleil, each accommodation has a covered terrace with outside furniture. In the chalets, guests will also find a seating area, a private bathroom with a shower and toilet. Free Wi-Fi access is available near the reception and each chalet features a fully equipped kitchen. On site, guests can also have their meals at the camping’s restaurant, which serves traditional cuisine or at the snack bar. Other facilities include a 24-hour front desk and free private parking. 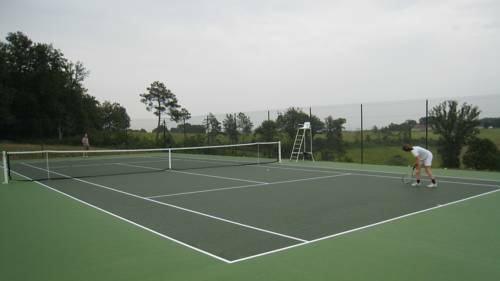 Guests can play tennis or table tennis. A 35-minute drive away they can visit Lascaux Cave. Périgueux Train Station is located 32 km from this camping. Set on the banks of the River Isle, this 2-star hotel offers a shaded terrace in the garden. Perigueux Train Station is 11 km away and the restaurant serves regional cuisine. The soundproofed guest rooms feature a flat-screen TV and a telephone. Each room offers a view of the garden and all include free Wi-Fi access. All of the rooms are non-smoking. Enjoy a buffet breakfast every morning while reading the newspapers provided. Before dinner in the restaurant, you can enjoy an aperitif at the bar in Hostellerie La Charmille. Luggage storage is possible on site and there is a children’s playground in the garden. Perigueux-Bassillac Airport is just 4 km from the hotel and the town centre is a 5-minute drive away. Private parking is free on site. Situated in Sarliac-sur-lʼIsle in the Aquitaine region, Weckerlin has a garden. This holiday home also features free WiFi. The holiday home is equipped with 3 bedrooms, a flat-screen TV and a fully equipped kitchen that provides guests with a dishwasher, an oven, a washing machine, a microwave and a fridge. The holiday home also provides a seating area and 1 bathroom with a bath. The holiday home offers a barbecue. A children's playground can be found at Weckerlin, along with a terrace. Périgueux is 15 km from the accommodation, while Brantôme is 32 km away. The nearest airport is Bergerac-Roumanière Airport, 66 km from Weckerlin. Hotel Rouffignac Saint-Cernin Preferred hotel ! Set in the market town of Rouffignac, this hotel is just 5 km from the prehistoric Rouffignac Cave. You can relax by the outdoor swimming pool, admire the manor’s large garden or enjoy a meal at the on-site restaurant. The rooms at Le Manoir des Cèdres are set in the main manor house or in the annex. Each one is air-conditioned and also includes an LCD TV with satellite channels. Some rooms have views of the garden. A buffet breakfast is served every morning in the breakfast room or on the terrace. The restaurant is called "L'Inattendu" and served creative cuisine based on seasonal produce. There is also a bar. Other on-site facilities and services include a games room, a playground and luggage storage at reception.Free private parking is possible on site and free WiFi access is available in the entire hotel. Other local attractions include Châteaux de Castelnaud and Lascaux II Caves, 25 km away. La Petite Vallée is set in Rouffignac Saint-Cernin and offers a seasonal outdoor swimming pool, barbecue facilities and a garden. The holiday home features pool views and is 39 km from Sarlat-la-Canéda. The property includes a living room with a flat-screen TV. There is a seating area, a dining area and a kitchen complete with a dishwasher and an oven. Speaking English and Spanish at the reception, staff are always at hand to help. The holiday home offers a children's playground. La Petite Vallée features a terrace. Périgueux is 30 km from the accommodation. The nearest airport is Bergerac-Roumanière Airport, 58 km from the property. Two-Bedroom Holiday Home in Auriac-du-Perigord is located in Auriac-du-Périgord. This holiday home also features free WiFi. The holiday home includes 2 bedrooms and a kitchenette with a dishwasher and a microwave. A TV is available. The holiday home offers an outdoor pool. Sarlat-la-Canéda is 34 km from Two-Bedroom Holiday Home in Auriac-du-Perigord. Brive Dordogne Valley Airport is 56 km from the property. Set in Saint-Laurent-sur-Manoire, Holiday Home Les 03 provides accommodation with a private pool. The holiday home features an outdoor pool and free WiFi. The holiday home has a TV and 5 bedrooms. The kitchenette is equipped with a dishwasher and a microwave. Périgueux is 12 km from Holiday Home Les 03, while Brantôme is 38 km away. The nearest airport is Bergerac-Roumanière Airport, 58 km from the property. Situated in Rouffignac Saint-Cernin, Aux Volets Bleus Chez Mark & Sylvie offers accommodation with free WiFi and flat-screen TV. The units have a fully equipped kitchen with a dishwasher, coffee machine, and an oven. A microwave and toaster are also provided, as well as a kettle. The holiday home offers a barbecue. Aux Volets Bleus Chez Mark & Sylvie provides a terrace. Sarlat-la-Canéda is 37 km from the accommodation, while Périgueux is 32 km away. Brive Dordogne Valley Airport is 56 km from the property. Situated in Hautefort, 7 km from Hautefort Castle, Mon havre de paix features accommodation with free WiFi and a garden with an outdoor swimming pool. The bed and breakfast offers a flat-screen TV and a private bathroom with free toiletries, a hair dryer and shower. A microwave and fridge are also provided, as well as a coffee machine and a kettle. Mon havre de paix offers a continental or Full English/Irish breakfast. The accommodation offers a terrace. Guests at the property can enjoy table tennis on site, or cycling in the surroundings. The nearest airport is Brive Dordogne Valley Airport, 63 km from Mon havre de paix. Located in Saint-Privat in the Aquitaine region, Three-Bedroom Holiday Home in Savignac Les Eglises is a 3-star property boasting free WiFi. Guests staying at this holiday home have access to a fully equipped kitchen. The holiday home offers an outdoor pool. Périgueux is 22 km from Three-Bedroom Holiday Home in Savignac Les Eglises, while Brantôme is 31 km from the property. The nearest airport is Bergerac-Roumanière Airport, 73 km from the property. Hotel Antonne-et-Trigonant Preferred hotel ! Le Mas des Bories is set in a renovated 16th-century farmhouse in the Périgord region, 500 metres from the Château des Bories. You can swim for free in the seasonal heated outdoor pool and fresh produce is served for breakfast. The elegantly decorated rooms feature a flat-screen TV, soundproofing and free Wi-Fi access. Some rooms offer exposed wooden beams while others have antique furniture. Upon reservation, you can enjoy regional dishes made with fresh produce at the hotel’s restaurant, and brunch can be prepared upon request on Sundays. Additional facilities include a fitness room with a treadmill and bicycles. Périgueux Golf Club is 9 km from this property and Bassillac Airport is only 2 km away. Free private parking is possible on site and there is a public tennis court 50 metres from the hotel. Set in Savignac-les-Églises in the Aquitaine region, Three-Bedroom Holiday Home in Savignac-Les-Eglises is a 3-star property featuring free WiFi. Guests can go for a swim in the outdoor pool. The holiday home is fitted with 3 bedrooms, a TV and a fully equipped kitchen that provides guests with a dishwasher and a microwave. Périgueux is 22 km from the holiday home, while Brantôme is 31 km from the property. Bergerac-Roumanière Airport is 73 km away. Below here is the hotels map of Limeyrat. Names and details of Limeyrat hotels can be shown on the map clicking on the prices icons.